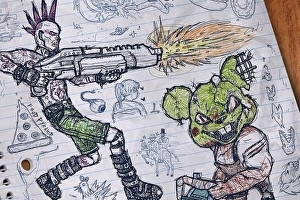 Stylised hero shooter Drawn to Death will drop onto the PlayStation Store on 4th April. A cel-shaded take on the popular genre, it mixes four-player fighting with Biro-designed visuals like something out of an ’80s pop video. Drawn to Death is the next game from David Jaffe – known for his work on God of War and Twisted Metal – and the first for his new indie team.